GLOBAL DISTRIBUTION: NATIVE e.Africa - Indonesia - Cooks; n. s.Japan. KEY FEATURES: Testa to 14cmØ. COLOUR pink to beige, often camouflaged with debris. PEDICILLARIAE cover testa protruding beyond the spines; each has a slender stalk and a cup-like tip, which is pale pink with a red centre with 3-jaws; on contact the jaws snap closed and inject venom. SPINES relatively short, non-venomous. 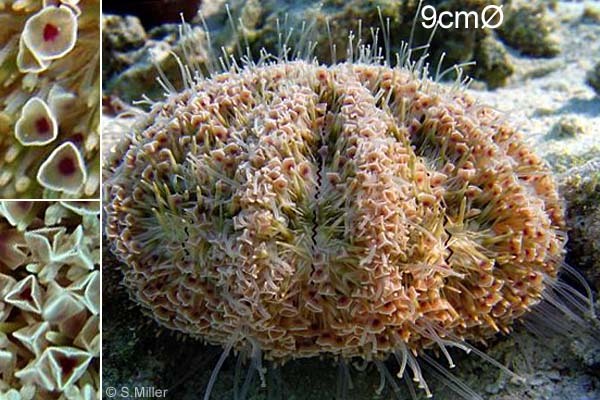 Pedicillariae jaws remain locked even when the pedicellariae are pulled over the urchin. The venom causes severe pain and muscular paralysis that may last around 6 hours. Death from poison unknown, but the pain can lead to accidental drowning. NEGATIVE SIGNIFICANCE: dangerously toxic appendages. Comments: The small round appendages (=pedicellariae) snap closed and inject venom causing serious pain, which may last for six hours. Very painful, but only fatalities were due to drowning. Remove any attached apprendages, soak in NON-SCALDING hot water. Seek medical assistance in case respiratory complications develop. Rarotonga: fieldspecimen+photo, southwest reef-flat (Aroa), 7/2005, Sonia Miller, with ID G.McCormack as Toxopneustes pileolus, 7/2005.